Alexandria Ocasio-Cortez’s “Green New Deal” continued to come under fire yesterday from all sides of the political spectrum, providing further evidence that her extreme plan is going nowhere fast. First, Senate Majority Leader Mitch McConnell announced that he would call the left’s bluff and bring the “Green New Deal” up for a vote in the Senate. Strangely, proponents of the “Green New Deal” were not happy that the legislation they claim is necessary to prevent an existential global crisis would be up for a vote. 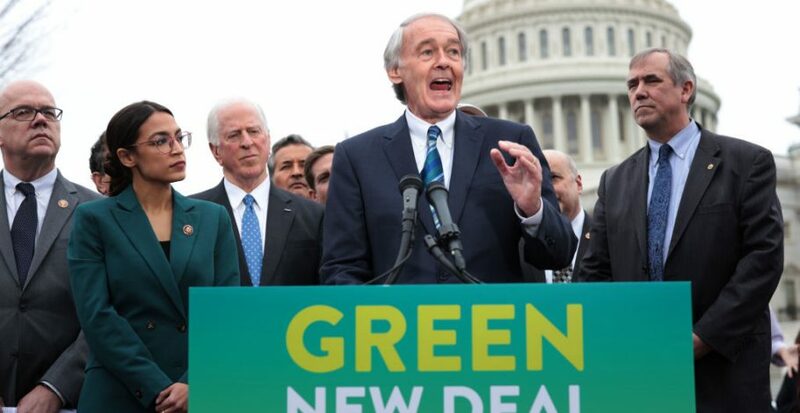 Massachusetts Senator Ed Markey, Ocasio-Cortez’s Senate sponsor of the “Green New Deal,” attacked McConnell on Twitter for pledging a vote on the bill. Weird. Usually, Senators like when their bills are voted on. “When I read the Green New Deal and I try to understand what they’re suggesting, I don’t understand how you’re going to give a job to everybody, how you’re going to give free college to everybody, how you’re going to create clean energy throughout the country in every building of the land, and then tally this thing up with $32 trillion on Medicare for All. That’s about $40 trillion plus, we are sitting…with $22 trillion of debt on the balance sheet of America,” Schultz said. With its extreme, half-baked ideas, the “Green New Deal” is predictably becoming unpopular among people from all political persuasions. As we have repeatedly said, Americans are too smart for this kind of nonsense. Finally, some elements of the left are catching up with the American people.